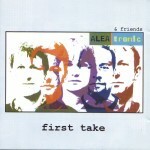 On “First Take” ALEAtronic present a musical collage ranging from classical/experimental through to jazz and popular mainstream genres. From the inspiring Innocent World or the jazzy Snake to the tongue-in-cheek Imagination, there’s something for everyone here.ALEAtronic are delighted to have been working with vocalists Yvonne Shelton, Mancunian session/gospel singer, and Eric Troyer, late of ELO Part II, now a member of The Orchestra. The album has been engineered and mixed by Dennis York, sound engineer supreme. ALEAtronic, a group of musicians from a classical background, are specialising in uniting elements from traditional, current and world music. The result is an ever expanding repertoire of challenging musical material that ALEAtronic perform on stage as well as taking it back into the community.To share their experience with the community and be a tool for the realisation of musical ideas arising from day to day issues is just as much ALEAtronic’s objective as recording and performing live on stage. Conceived over a period of two years “First Take” features material originally written and performed by ALEAtronic around the North of England and specifically in Manchester, UK. Having been “in love with music all her life”, Manchester-based Yvonne sings, directs choirs and groups, and also runs arts and music projects. She has appeared extensively for BBC TV and Radio as well as recording and touring with artists such as Chaka Khan, James Taylor, The Beautiful South, Simply Red, Gabrielle, George Michael, Lemn Sissay, Foreigner, Puff Daddy and the Spice Girls. Yvonne also had a stint as a singer in the musical “I have a dream”. Yvonne first worked with aleatronic on some of the Hallé Orchestra’s education and community outreach projects. Eric Troyer grew up in Elkhart, Indiana in a musical family with a conservative religious background. After college in Indiana and California, Eric settled in New York City where he began singing vocal sessions with world class artists like John Lennon, Billy Joel, Bonnie Tyler, Aerosmith, Kiss, James Taylor, Carly Simon, Sisters of Mercy, Meatloaf and Celine Dion. Eric is well established as a jingle writer and as a composer for television, film and incidental music. He is also a singer/songwriter for ELO Part II and more recently, The Orchestra. Eric today lives in New Jersey running his own production company, Wonderwerks.